Location, this apartment was great in many ways. As a Columbia Student, it was a 10 - 15 minute walk to campus, for which I got to walk through the park and get a little activity each day (beautiful scene when it snows too!). Its also a couple minutes walk from the 110th B,C trains, which meant I could very easily get around the city using public transport regardless of rain or snow. There is also a bus stop right around the block, which goes downtown and also hits WholeFoods on the way. What I really liked was that our street, Manhattan Ave was on the quieter side, but one avenue over on Frederick Douglass Blvd has a great range of entertainment and dining places. S. K.
Summer in New York. Enjoy the sunny weather by picnicking on a lush lawn, watching live music, seeing a movie, playing free games, or discovering a new area of the Park. This Summer Guide has all you need to know about the season’s happenings in Central Park. 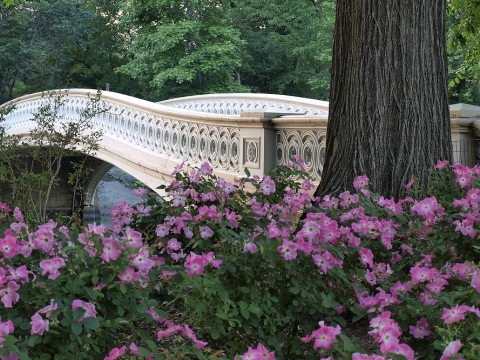 The Central Park Conservancy is responsible for all of the essential work that keeps Central Park beautiful. Morningside Park is named for the sunny eastern side of the cliff that separates Morningside Heights from Harlem in Northern Manhattan. It is one of four designated Historic Harlem Parks. The others are Marcus Garvey, St. Nicholas and Jackie Robinson Parks. In 1867, Andrew Haswell Green, Commissioner and Comptroller of Central Park, recommended that a park be located in Morningside Heights. He argued that it would be impractical to extend the Manhattan street grid over the steep topography. The City received jurisdiction over the 30-acres property in 1870 but did not begin constructing the park until 1883. The Board of Commissioners rejected an 1871 design by Parks Engineer-in Chief M.A. Kellogg and an 1873 plan by landscape architects Frederick Law Olmsted and Calvert Vaux, the co-designers of Central and Prospect Parks. In 1880, the Board hired Architect Jacob Wrey Mould to rework Olmsted and Vaux's plans. Mould designed the promenade and buttressed masonry wall that encloses the park along Morningside drive. Although a construction contract was awarded in 1883, Mould died in 1886 before the work was completed. Fourteen years after rejecting their original proposal, the Board hired Olmsted and Vaux to continue improvements to Morningside Park. The architects planted vegetation tolerant of the dry, rocky soil and created two paths, one broad, one meandering, to cross the lower portion of the park. Retained as a consultant, Vaux saw the work to completion in 1895, the year he drowned. Parks Superintendent Samuel Parsons, Jr. wrote of Vaux's work, «...perhaps Morningside Park was the most consummate piece of art that he had ever created». The park's design continued to evolve in the 20th century. Monuments raised in and around the park included Lafayette and Washington (1900) by Frederic-Auguste Bartholdi, the Carl Schurz Memorial (1913) by Karl Bitter and Henry Bacon, and the Seligman (bear and Faun) Fountain (1914) by Edgar Walter, one of the fountain sculptors for the great San Francisco world exposition in 1915. Between the 1930's and the 1950s, playgrounds, basketball court and softball diamonds were constructed in east and south parts of the park. In 1968, student and community protesters halted construction of a gymnasium in the park intended for use by Columbia University and the public. The excavated foundation was converted into a pond and waterfall in 1989-90. The project also included installing new play equipment, creating a picnic area, planting new trees, and rebuilding the ballfields. The park has undergone improvements in recent years. In 1997, the Lafayette and Washington monument and the Seligman Fountain were conserved under the City Parks Foundation Monuments Conservation Program. In 1998, the Dr. Thomas Kiel Arboretum was planted and the bluestone steps and paths at 116th Street and Morningside Avenue renovated. In 2003 the Parks Foundation Monuments Conservation Program returned to the park to begin extensive conservation work on the Carl Schurz Monument at 116th St. and Morningside Drive. You may read more about the conservation project here. The Friends of Morningside Park commissioned and published a Master Plan for Morningside Park in 2000 and more recently several of the key projects called for in that plan have been realized. These include the rebuilding of the pedestrian crossing and stairs at 120th Street, rebuilt ballfields, reconstructed perimeter sidewalks, new historical replica perimeter street lights with the addition of pedestrian sidearm lights, and a new playground at 116th Street designed by Parks Dept. designer Alex Hart which is skillfully integrated into the Olmsted and Vaux design.